Home » Looking Good » shopping » Shop Your Way Max offers FREE 2 Day Shipping! 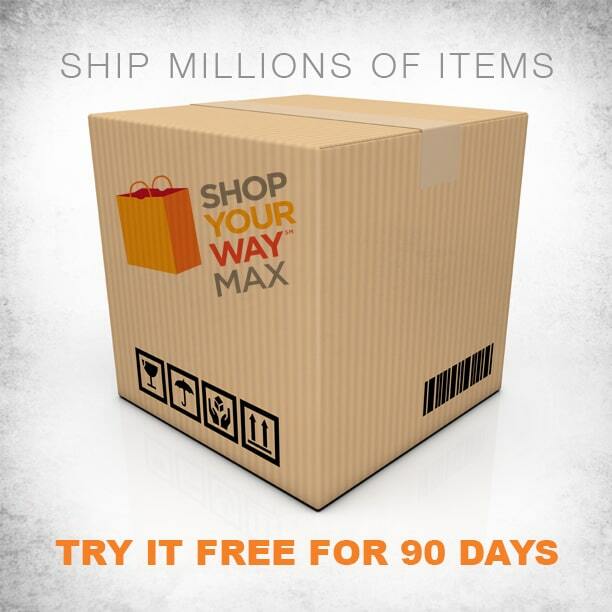 Shop Your Way Max offers FREE 2 Day Shipping! I am a huge fan of shopping online. I can find just about everything I am looking for without wasting several hours and way too many dollars in gas running from store to store. One thing I hate about online shopping, though, is companies that charge a ridiculous amount of money on shipping. I have seen places that charge $15 to ship a pair of gloves! Really? Why is it the things that are the lightest in weight cost the most to ship? Whenever I am shopping online I look for free or incredibly cheap shipping options. Sears and Kmart offer a great deal in their Shop Your Way MAX shipping program! Meet Shop Your Way MAX, which offers free two-day shipping on Sears and Kmart merchandise for just $39/year. Shop Your Way MAX is available to members of Shop Your Way, a free online social shopping program that offers perks and points whenever you shop at Sears or Kmart. Click here to join Shop Your Way now and start saving. Usually free shipping offers are on the super-slow, you have to wait forever option. Love that this is free 2-DAY shipping! Great to see another retailer step up and match Amazon Prime! Competition is good! Great offer. I had paying a lot for shipping and it taking forever. Thanks for sharing. I do LOTS of online shopping - this is definitely a must! Thanks for sharing, I will definitely check this out. I think the 90 day free trial is a brilliant move on their part. Let us experience how awesome it is and get hooked! lol. But seriously their price is so much more reasonable than other "member" prices.